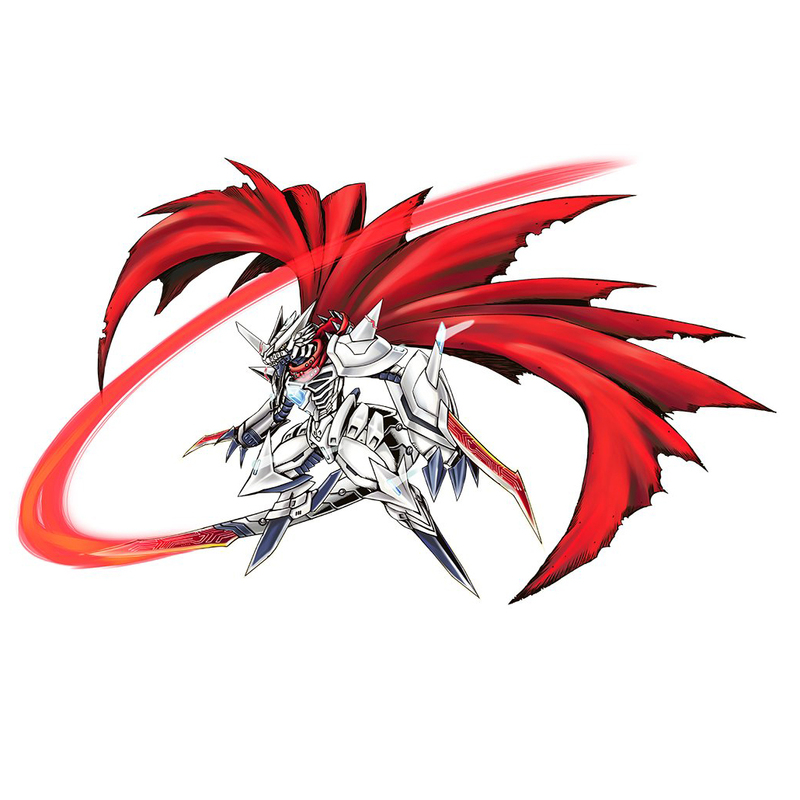 It evolved into this form after repeatedly meeting and parting with Digimon over its long journey, and living through countless fierce battles. It militarily intervenes in the strife that occurs incessantly throughout the Digital World, seeking ceasefires, and has brought aid to the Digimon on-site who have suffered harm. The result is not always a success, but the tears Savior Hackmon sheds before those tragic scenes strengthen it further, as it earnestly reaches out to the next Digimon that cries for help. It is capable of using its legs to walk bipedally despite them being blades; in addition, crimson blades extend from both of its arms and its tail, and its blade-covered body exudes an aggressive air. The crystal in its chest is a crystallisation of proof that it refined its power with no lack of effort. Its Special Moves are skewering through the enemy from a flying kick posture with the blades on its feet (Resist Raid), and rapid-firing shots of fire from its mouth like a machine gun, burning the enemy to cinders (Meteor Flame). 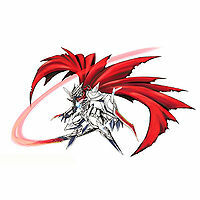 Its "Trident Saber", which assaults the enemy with the three red blades its tail and arms are equipped with, relentlessly cleaves them apart whether or not they're swathed in Chrome Digizoid. A form of Bao Huckmon which repeatedly met and parted with Digimon over its long journey, lived through many scenes of carnage, and evolved. It militarily intervenes in the strife that occurs incessantly throughout the Digital World, seeking ceasefires, and has brought aid to the Digimon on-site who have suffered harm. The result is not always a success, but the tears it sheds before those tragic scenes make Savior Huckmon strong, and it earnestly reaches out to the next Digimon to cry for help. Its legs are capable of bipedal walking despite being blades, crimson blades are produced from both of its arms and its tail, and its whole body has taken on the aggressive style of a blade. The crystal in its chest is a crystal of proof that it refined its power with no lack of effort. This profile matches the one used on the Bandai Collectors Shop site. 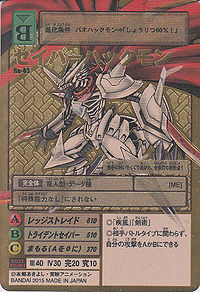 Resist Raid  レッジストレイド Rejjisuto Reido Skewers through the enemy from a flying kick posture with the blades on its feet. Meteor Flame  メテオフレイム Meteo Fureimu Rapid-fires fire shots from its mouth like a machine gun, burning the enemy to cinders. 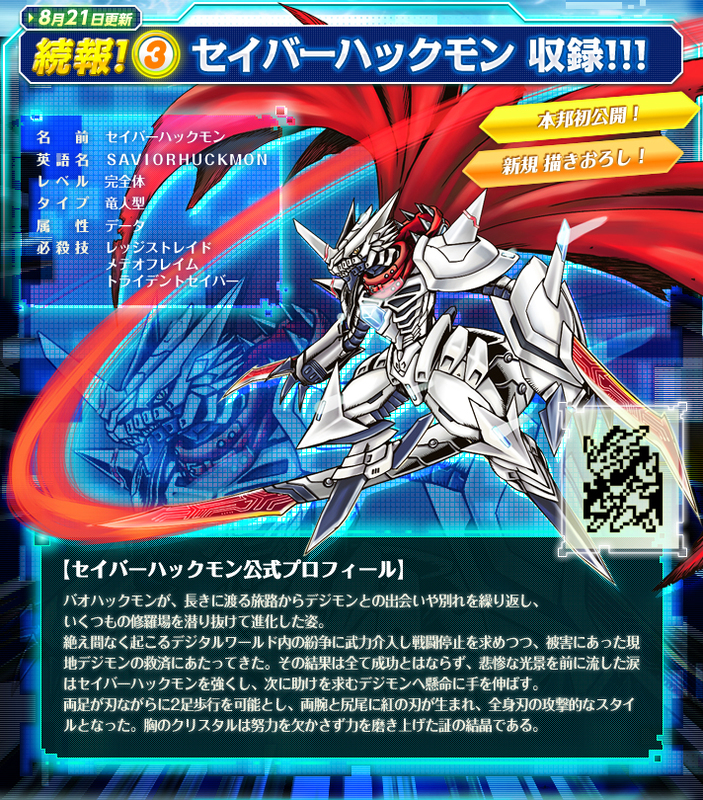 Trident Saber  トライデントセイバー Toraidento Seibā Assaults the enemy with the three red blades equipped to its tail and arms, relentlessly cleaving them apart whether they're swathed in Chrome Digizoid or not. Having fought through countless battles, this cleaver is armed with blades all over!